In my past--had a Goldwing and currently own an '03 Silver Wing Honda scooter. I have had it ten years--and wanted something a little lighter, smaller, better gas mileage. Bought this new '09 Sym HD 200 last month--couldn't find any hardly anywhere. Had it shipped in from Seattle to Kansas City. 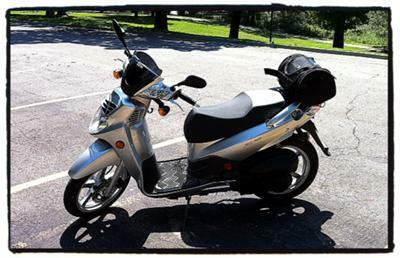 Great scooter for the money--was $3000 less than my Silver Wing. Have already changed the oil (no filter) and gear oil--inexpensive and easy. Rides very smooth and easy, very easy to handle. Brakes (disk in front, drum in back) are a little soft on the drum brake--but nothing too bad. Just to slam them on all the time. I'm told that they can go for years/miles. All in all--for the money--love everything about it except small storage--but you can put a bag on the back--get an aerostich travel, bag--etc--and it's fine. One real nice feature is the flat panel underfoot and bag hook. you can get a bag of groceries and have the weight placed on the floorboard--with the hook holding the bag in place.